Can the American consumer carry the entire weight of the bullish hopes of equity investors on her shoulders, especially if we start to see signs of stress in emerging market bond and equity markets? New deal democrat recently noted that Coincident indicators stalled in July and with housing stocks also stalling out in relative strength, these are warning signs that the US consumer is starting to struggle. If this last bastion of global economic strength start to wane, the bullish case for stocks would only get weaker. As I write this, global equities are selling off because of nervousness about an attack on Syria. But why should the market be nervous? Is it because of a spike in oil prices? Syria is not a major oil and gas producer and oil prices should normalize once the political situation calms down. On that basis, the knee-jerk sell on Middle East turmoil response is unwarranted. It is an election that few German politicians will soon forget. In 2002, as the US was ramping up its anti-Iraq propaganda preparatory to invading the country the next spring, German Chancellor Gerhard Schröder said, "Germany will not participate in a war against Iraq." It is a sentence that put relations between Berlin and Washington in a deep freeze. But Schröder, of the center-left Social Democrats (SPD), didn't mind: Just weeks after making the pledge, he eked out a close re-election victory against conservative challenger Edmund Stoiber who had refused to be so categorical. Chancellor Angela Merkel appears to be betting that the horrific images that emerged from last week's apparent use of chemical weapons in Syria will be enough to trump the German electorate's traditional pacifism. On Monday, she came out strongly in favor of an international response to the massacre last Wednesday. "The alleged widespread use of gas has broken a taboo," Merkel's spokesman Steffen Seibert said. "It requires consequences and a very clear response is needed." Peer Steinbrueck, a candidate to be Germany's next Chancellor, has demanded to halt EU-US trade negotiations amid revelations that Washington is spying on its European allies. "I would interrupt the negotiations until the Americans say if German government offices and European institutions are bugged or wiretapped," Steinbrueck said on Sunday (24 August) in an interview with public broadcaster ARD. He noted that the current government, run by Angela Merkel, is trying to cover up the scandal and that it makes no sense to negotiate on sensitive trade issues when the US can know at any point what the EU is discussing internally. Already, the NSA spying scandal is seeing a fallout for US companies. German email service providers are seeing a surge in demand in the wake of the NSA revelations (also see my blog post Snowden affair fallout: RIMM experience as a blueprint for US tech?). 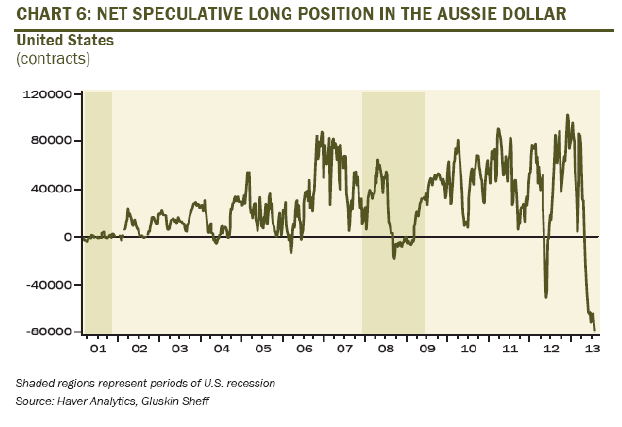 Regardless, any time the prospects of global trade seizing up is not good news for equity prices. In conclusion, I believe that the knee-jerk reaction to sell stocks on the fear of an oil price spike is unwarranted. However, I have other concerns of other risks. If these risks materialize, they could cause grave concern for Europe and the growth outlook for the global economy. 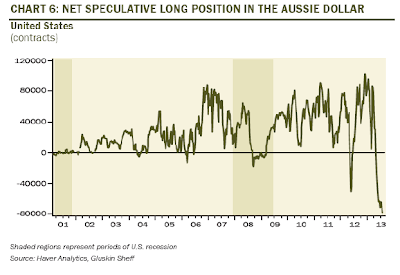 Nearing an inflection point: Watch the USD! Last week I wrote that I was seeing the classic signs of a late market cycle rotation into deep cyclical stocks, which would likely coincide with a stock market rally for several weeks (see A classic late-cycle rotation), but recent developments suggest that the cyclical rally may be on its last legs. Consider this chart of the relative performance of the Morgan Stanley Cyclical Index (CYC) against the market. CYC staged a relative breakout but has pulled back below the breakout level. While this may be a breakout-pullback-retest pattern, other market indicators are flashing more cautious signs that this was a false relative breakout. 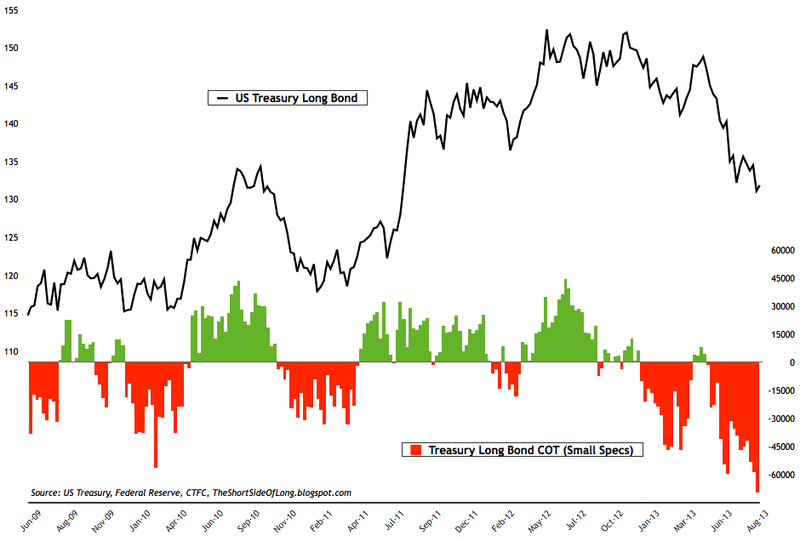 Bond prices poised to rally? 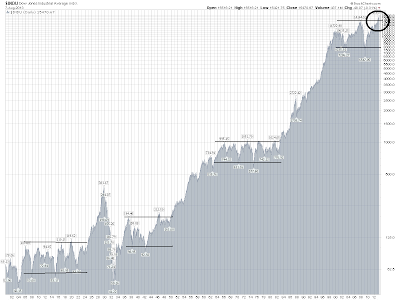 We may be nearing an important inflection point in the markets. Bond prices, while have been been hammered recently, may be poised for a rebound. Here is a longer term chart of the 10-year Treasury yield, which shows that the 10-year yield is now testing both an important downtrend line and a Fibonacci resistance level. These are typical signs that bond yields and prices could start to revert soon. Here is the chart of the 30-year Treasury yield in the same time frame. Note how the 30-year is also testing the 50% Fibonacci retracement level. With both the 10-year and 30-year yields testing key resistance levels, my hunch is that bond prices may be poised to rally soon. The case for a relief rally in Treasuries (and a corresponding decrease in yields) is built on excessive pessimism already built into the Treasury market, the likelihood that short-term rates controlled by the Fed will stay near zero for a very long time, and the reality that higher yields -- and mortgage and auto-loan rates -- themselves help brake the economy and could make the central bank less aggressive in stepping back from its stimulus. The entire financial world, it seems, has pivoted toward an expectation that rates will surely keep rising. The Daily Sentiment Index for Treasury bonds showed only 9% were bullish on Treasuries (meaning only 9% were betting on lower yields), according to RBS strategists Friday, a lopsided stance against bonds that’s confirmed by other measures of large investors. Retail investors, as noted, have pulled some $90 billion from fixed-income funds since Memorial Day, says the Investment Company Institute. With the rush higher in Treasury yields, the gap between short- and long-term government-bond rates, known as the yield curve, is already near an extreme. The two-year Treasury, which is tightly tethered to the Fed-dictated overnight rate, is just below 0.40%. With bonds at 2.90% this week, that gap of 2.5 percentage points is quite wide, exceeded only for rather short periods of time over the last 30 years. (Given that overnight rates have never been zero deep in a U.S. economic recovery phase, it’s possible what used to be an extreme gap is less extraordinary on an absolute basis, but nonetheless should restrain further huge upside in rates. If bond yields were to fall, what does that mean for stock prices? Bulls would argue that lower long rates are bullish for stocks because it implies P/E expansion. 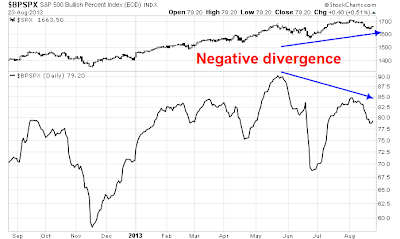 Bears would point to the historically inverse relationship between stock and bonds. I look for clues in the foreign exchange market, where the US Dollar is testing an important uptrend line and what it tells me about the nature of sector leadership and their implications for the direction of equity prices. 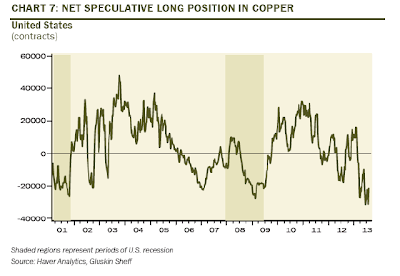 If the USD continues to rally, it would be negative for commodity prices. We saw that last week as the USD strengthened across the board against virtually all currencies and commodity prices and deep cyclical stocks struggled. Last week, I highlighted the turnaround in industrial commodity prices as a positive sign for the deep cyclical sectors. The bottom panel also shows the low and negative correlation of industrial commodity prices to the USD. 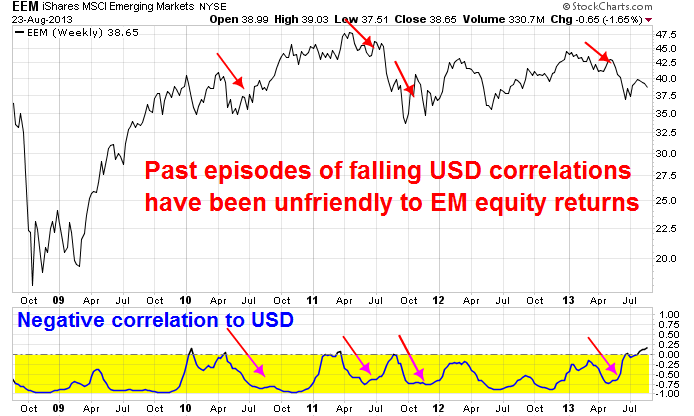 As well, USD strength has also been negative for emerging markets. Here is a chart of EEM, the emerging market equity ETF, showing its low/negative correlation to the USD. 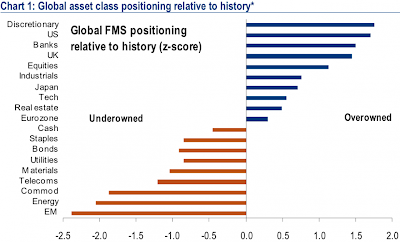 Note that during past occasions when correlations have risen to around 0 and started to mean revert downwards, it tended to be negative for EM equities. FLASH – Fed to reduce QE by $5bn per month starting in October. FLASH – Fed to reduce QE by a total of $15bn from October through December and thereafter leave monthly purchases at $70Bn per month for the indefinite future. FLASH – Fed anticipates that it will take no additional policy steps until after January of 2014 (post Bernanke replacement). FLASH – The Fed may elect to increase monthly purchases after January of 2014 based on data. This small ball approach will backfire. Dragging out the process will drag out the pain. As of today there is not much evidence of Taper Pain in the USA. But the money is moving quickly outside of the border. How long will it take for some of the Black side of the taper to come back home? As Krasting noted, we are not seeing the same market reaction in EM-land. The relative performance of EMB, the emerging market bond ETF, against HYG, i.e. junk vs. junk, has breached a critical relative support level and the ratio is showing signs of considerable stress. Moreover, the FX markets are showing signs of anxiety over tapering as de-risking continues. The chart below of DBV as a measure of the currency carry trade of buying high yielding currencies and shorting the low yielding ones shows that this trade continues to sell off in the wake of the May 22 Fed tapering message as it violated an important level of technical support last week. The only source recent high-beta market leadership left are the consumer discretionary stocks, whose strength continues unchallenged. The key question then becomes: Can the American consumer carry the entire weight of the bullish hopes of equity investors on her shoulders, especially if we start to see signs of stress in emerging market bond and equity markets? Valuation signals: As I wrote before (see A new secular bull? Don't count on it! ), private equity firms are cashing out their equity holdings, value investors can't find any good values and VLMAP, Value Line's Median Appreciation Potential for stocks, is signaling very low return levels for equities. Mark Hulbert also wrote about the VLMAP sell signal here. Smart investor trading signals: In addition to long-term oriented value managers feeling uncomfortable with stocks, George Soros' largest position is a bearish bet on SPX. I am not sure I want to be on the other side of a Soros trade, do you? The tapering risk-off trade isn't over, especially in the credit and foreign exchange markets. As we move into September and, in all likelihood, the Fed starts to taper down its QE purchases, I would expect further angst from the markets. The House GOP is hopelessly fractured on spending strategy. Senate Republicans who might otherwise broker a deal face primary challenges that make compromise potentially deadly. Other Senate Republicans are jockeying for 2016. And congressional Democrats have no appetite for any bargain — grand or otherwise — that cuts entitlement spending. President Barack Obama at his Friday news conference before leaving for vacation lectured Republicans and mocked their threats to shut down the government rather than fund his signature health care law. Hardly a promising sign for the fall. The key bearish trigger here is the US Dollar. If it starts to rise significantly, bulls should be battening down the hatches. We are seeing some welcome news out of China. The plans made by the PBoC to liberalize bank deposit rates is certainly a step in the right direction to ending financial repression of the household sector in China, which would help re-balance growth towards the consumer. The bigger picture remains uncertain, as the problems in the banking sector is starting to make China look like pre-crisis Europe. To explain, the eurozone crisis was a combined banking and sovereign crisis. Before crisis, banks raced to lend to peripheral countries because of the perception of that there was little or no credit risk. It's all one eurozone, right? They are all sovereigns in the eurozone and sovereigns don't default, right? 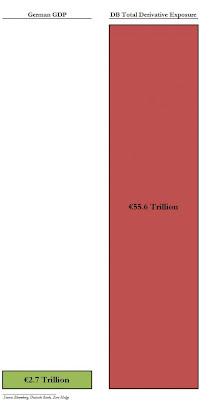 Banks gorged themselves with lower credit eurozone country debt, and, in particular, the bonds of their own countries. Yield spreads between peripheral country bonds and Bunds narrowed to microscopic levels. When the crisis hit, national governments were handcuffed from bailing out their own banking system because their banks were stuffed full of their own governments' debt. So how do you bail out yourself? The AMCs were to assume debt from fundamentally viable companies and swap it for equity. This was part of the massive SOE restructuring plan of the time: the AMCs were expected to act like private equities—stern and dispassionate board directors motivated by profit. It was thought that this would help create SOEs that thought and acted like commercial companies. To the contrary, the result was an implicit guarantee to SOEs that they would not go bankrupt, which in turn supported the general disregard for debt-equity ratios and any calculation related to servicing debt. The SOEs’ are widely acknowledged to be one of the biggest hurdles to China reforming its economic strategy, due to a combination of their poor performance, easy access to credit, and significant political power. I don't know how this all ends up, nor do I know the timing, but this won't end well. At worst, it ends with a banking crisis that spills over beyond China's borders and sparks a global financial panic. At best, bailing out SOEs and local government authorities amounts to financial repression of the household sector and impedes the government's stated policy of re-balancing growth to the consumer and household sectors of the economy, which would create long-term headwinds for China's growth path. [The] donor had stipulated the trustees could use part of the funds to pay down the debt if, in their opinion, national circumstances merited a payment. It seems that you can haunt the government from beyond the grave. Years ago, one of the first things that I learned when I ventured into technical analysis was sector and industry rotation. Technical (which are not necessarily economic) bull phases start with leadership from interest sensitive groups, such as banks and homebuilders. The leadership baton is then passed to consumer related sectors, capital goods and so on. 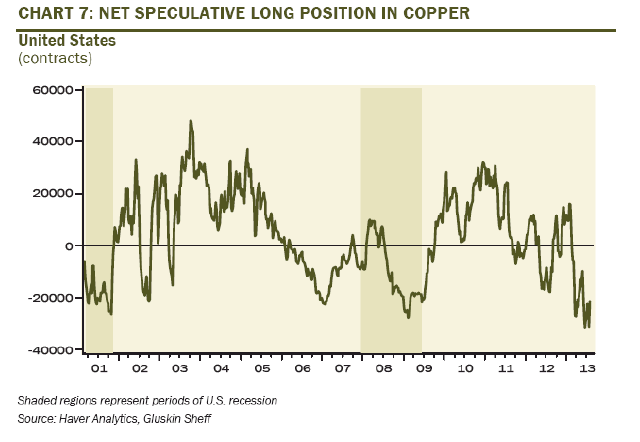 The terminal phase is signaled by the leadership of deep cyclical resource sectors. I believe that's what we are witnessing now. First of all, there is little question that the leadership of homebuilding stocks are rolling over. The chart below shows the market relative returns of the homebuilding ETF (XHB), which is in a relative downtrend after breaking key relative technical support levels. Meanwhile at the other end of the spectrum, we have seen a divergence between equities and commodity and commodity related plays. The chart below shows the SPX (in black) and the CRB Index (in red) for the last three years. For the first couple of years, the two more or less moved in tandem, but a divergence was much in evidence in 2013 as stocks went north and commodities went south, mostly because of angst over China. In the last week or two, the data out of China has been more positive (though not everyone believes the official statistics) and commodity prices appear to have bottomed and they are starting to rally. Meanwhile, the equity uptrend remains intact. These are the classic signs of a late cycle rotation into deep cyclical sectors of the market. Under these circumstances, give the market the slightly whiff of positive news and it would spark an oversold rally. That's what's happening now. 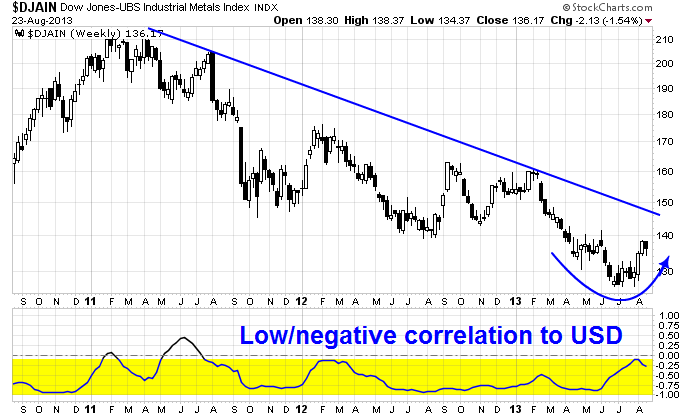 Here is the relative performance of the metals and mining sector (XME) relative to the market. XME has rallied through a relative downtrend and there may be further relative upside. I have outlined the Fibonacci retracement levels as likely upside targets. Even the lower 38.2% Fibo level shows considerable potential upside from current levels. Here is the longer term XME relative chart. XME remains in a downtrend relative to the market and the site of the relative downtrend line approximately coincides with the 38.2% Fibonacci retracement level from the previous shorter term chart. Similarly, we have seen a relative rally from emerging market stocks (EEM) against US equities (SPY) as it bounced off a long-term relative support level. In the last couple of weeks, we have seen US equities pause and then weaken. Last week, it tested the 50 day moving average, which is considered by many technicians to be an important support level. Given what I am seeing in the change in sector and industry leadership, I believe that we are seeing a late market cycle rotation into the deep cyclicals and the bull may have one last gasp upward. This is a tactical bullish call for a few weeks. 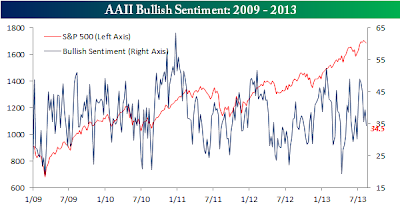 The AAII's latest sentiment survey (via Bespoke) shows that bullish sentiment has retreated, which should be supportive of a rally. Understand that this call for a last gasp rally led by the vastly oversold deep cyclical stocks, a sort of Unternehmen Wacht am Rhein by the bulls, is a tactical call. My inner investor is lightening up positions now, while my inner trader wants to jump on board for the rally, which can be powerful especially for oversold stocks. One of my long-time readers recently asked about Ken Heebner's position in US long Treasury bonds. I then remembered that one of my earliest posts demonstrated a technique of mine for reverse engineering a fund's factor exposures and I had written about Ken Heebner's CGM Focus before.. In response to the request, I dug out my model which I hadn't touched since 2010 to analyze the factor betas of Heebner's CGM Focus fund, which has a good long-term, albeit volatile, record. As Ken Heebner's style tends to be macro-focused and he has a reputation for swinging for the fences, I was interested to see his factor exposures. With the caveat that this form of analysis isn't perfect and the magnitudes of the exposure aren't always well calibrated, here is my estimated factor beta exposures of CGMFX over the last few years. First of all, in response to my reader's question, CGMFX was short the US long bond, though the short position appears to be getting reduced. He remains overweight the homebuilders and he continues to build those positions. My analysis also shows that the beta of his fund to the Morgan Stanley Cyclical Index is positive and growing, though it is unclear how much of that is related to the homebuilding position. Other notable sector exposures include an overweight in Financials, which has outperformed. As well, Heebner appears to have caught the move in Healthcare stocks, which has also been market leaders. My analysis of sector relative strength shows that Financials, Consumer Discretionary and Healthcare to be the recent leadership and laggards to be the resource related sectors, as well as Technology. This indicates that anyone buying into CGMFX is buying a high price momentum portfolio. As my previous analysis of the interaction of price momentum and trend following models shows, a momentum chasing strategy works well during bull phases but will get hurt badly during bear phases and market corrections. While I recognize that Ken Heebner is known not to be afraid to trade in and out of positions, investors should recognize the risks of this approach and diversify their style exposures accordingly. Bonds rated CCC and lower lost 2.4 percent between May 22, when Bernanke said the central bank was considering reducing or ending the asset purchases, and June 19, when he reiterated those comments. Since then, the debt has gained 3.5 percent as yields fell to an average of 9.79 percent on Aug. 7 from a seven-month high of 10.6 percent on June 25, Bank of America Merrill Lynch bond indexes show. Most risk assets “have probably retraced a good 75 percent on average of the widening that occurred in the late May and June period,” Michael Materasso, co-chairman of the fixed-income policy committee at Franklin Templeton Investments in New York, said in an Aug. 5 telephone interview. With this shift in tone, don't expect the Fed to push yields down anymore. The Fed won't be pushing you to take as much risk. Consider what this means for stocks. If the economy does truly take off and earnings grow, then stock prices can rise. However, don't expect stock prices to rise because P/Es are going to go up because the Fed is pushing the market to take more risk. In fact, P/Es are more likely to fall and it will be up the the E component of that ratio, namely earnings, to do the heavy lifting. While some credit spreads have narrowed, other carry trades appear to continue to get unwound. Consider DBV, which is an ETF as a measure of the currency carry trade. DBV tanked since May 22 and it has struggled with a key technical resistance level. Does this look like that risk is getting bought again? As well, I had been watching the relative performance of EMB, the emerging market bond ETF, against HYG, the junk bond ETF. The EMB/HYG ratio fell through a key relative support level and has had trouble regaining relative strength. These conditions suggest to me that while the risk-on trade may be returning in the US, it is not necessarily coming back globally. The market hasn't totally "healed" since the news of tapering hit the tape on May 22.
Who pays for China's excesses? I had some feedback to last week's post entitled Market perception of China macro risk set to rise. Notwithstanding the upside surprise in Chinese exports, the bigger question is, "If China engaged in over-investment in infrastructure, then who pays for the excesses as she re-adjusts her economy from an export and infrastructure driven growth model to one based on the consumer?" It's the same question asked when Lehman blew up and took down the banking sector in the United States, or when Greece and other peripheral eurozone countries got into trouble with their debt. Who pays? China's growth story has been told many times. She leveraged her position as a provider of low cost labor to become a global manufacturing giant. Her growth was also fueled by an infrastructure boom, initially to upgrade facilities like transportation, etc., which then morphed into a property boom because local savers had nowhere else to put their funds. Today, we are now faced with the specter of the see-through apartment buildings, empty shopping malls and white elephant, but spanking new, airport, railway and port facilities sprinkled throughout the country. It's not that China, as a developing country, doesn't need to upgrade its investment in infrastructure. 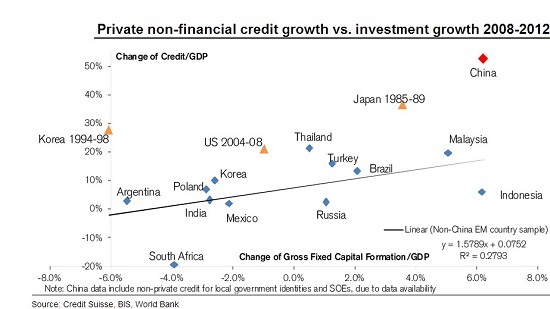 But the investment boom seems overdone even compared to the record of other rapidly developing economies. This chart below from Pictet shows that Japan's investment as a percentage of GDP peaked out at 36% in 1973, South Korea peaked at 38% in 1991 and China recently peaked at a staggering 46% in 2010, but levels remain elevated. As the new leadership changed, the tone of policy has also changed significantly. Gone is the emphasis on export and infrastructure led growth at any price. Beijing has made itself clear. Given a choice between growth and financial stability, it will pick the latter. Moreover, the government has also made it clear that it wants to re-balance the engine of growth from exports and investment to the consumer. The top priorities for the PBoC changed from “stabilizing growth, containing inflation, managing risks” in the Q1 report to “stabilizing growth, rebalancing the economy, promoting reforms, and managing risks”. It is clear, at least to me, that if the priorities are "rebalancing the economy" and "promoting reforms" so that the household sector becomes the engine of growth, then financial repression of that sector must end. This means an end to the cap on bank deposit rates, which led to negative real interest rates for savers, which benefited borrowers, which were mainly SOEs and Party cadres, with low and negative real costs of capital. In addition, the ordinary saver had no real outlet for his savings because of the under-developed nature of China's debt and equity markets, poured his funds into real estate, fueling a property boom, which was propelled upwards by a credit boom. One way to correct that is the internationalization of the RMB, which is already happening. As well, China's seeming endless supply of cheap labor is slowly ending and wages are starting to rise. Analysts have characterized this development as the Lewis turning point (see my previous blog post discussing this issue here). Rising wages can also be viewed as a positive development for rebalancing as it benefits household income levels. I have been skeptical about the sustainability of the Chinese growth model since at least 2006-7 but I have never argued that China would collapse, let alone collapse within six months. My argument is that China’s growth model, which is not at all unique and for which there are many historical precedents, is usually wealth enhancing in its early stages, and then becomes wealth destroying once capital is systematically misallocated. When that happens, debt rises at an unsustainable pace until we reach debt capacity limits, in which case the country will have a debt crisis. I have usually estimated that it would reach debt capacity limits around 2016-18 but now I think it is likely to happen earlier. The export sector, because wages will rise and margins get squeezed. Already, even Chinese companies are considering offshoring. 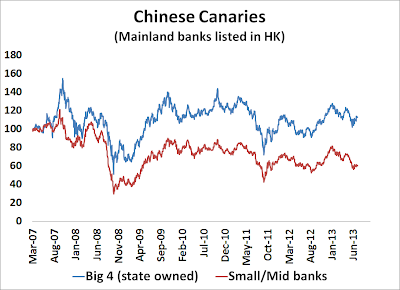 SOEs, which have benefited from the cheap source of capital at low or negative real interest rates. The problem for China's leaders, their critics point out, is that in some ways they're not so different from Bo. Many of them are equally well off or have families who have grown rich under the system — and just as intent on placing their children in elite schools outside China. Bo was actually less obsessed with money than many other politicians are, said a Taiwanese businessman who knows the family well. "He was into power and women. Money was always second," said the businessman, who spoke on condition of anonymity. The real estate sector, because of reduced infrastructure spending and a reduction of the flow of funds by savers as they acquire more alternatives. Local government authorities, who financed themselves with property sales to private developers. If infrastructure investment were to wane and there has been mis-allocated capital into this sector because of government decree, then the bigger question is, "Who pays for all this bad investment?" The effects of mis-allocated capital would be exacerbated if there were to be a collapse in property prices, leading to a mountain of non-performing loans. How do the losses get distributed? Loan writedowns and writeoffs: This means that the State banking sector pays, which means that losses are socialized and paid by the household sector. Money printing and inflation: Losses are socialized and paid by the household sector. Austerity: Losses are paid by the household sector. You see the problem? How can any of this happen if Bejing's latest priority is to enhance the income and wealth of the household sector? Recall that the highest priority of any Chinese leadership is social stability, which is not enhanced by further financial repression. Party insiders: If Party insiders got enormously wealthy during the boom, then they must be made to pay. Already, we are seeing anti-corruption campaigns. Business Insider has reported that party members are undergoing re-indoctrination and the BBC reported that officials will be banned from owning foreign cars. Should a financial crisis flare up, expect more purges and show trials of officials. Small and medium enterprises, or SMEs: It is said that very few people in China got rich without some "original sin", usually through a close relationship with a local Party official. Entrepreneurs could become easy targets for purges, should the political climate turn in such a direction. Foreigners and foreign owned enterprises: Foreigners and foreigner owned enterprises are also easy targets as they have little political capital to spend. Even in the United States, Congress has enacted measures that have hurt foreigners because it knows that foreigners don't vote. Inflation: PBoC could print and inflate some of the debt away but the USD peg makes that a problem. So look for more steps toward exchange rate liberalization like this. Given the currency peg, itt is unclear how techniques like forbearance or LTRO style solutions would work. Household sector: Finally, the household sector will have to bear some of the pain as the property sector will likely have collapsed. That's why some party cadres will have to be made into scapegoat for political reasons. I respect Michael Pettis when he states that Beijing has acted preemptively to avoid a financial crisis. I am not sure, however, if their actions have been sufficiently fast or whether they are effective enough to do so. Given the enormous challenges and constraints that Bejing operates under, they don't have a great deal of margin for error and their path will be extremely difficult to navigate. They have taken the first of many of the steps in the direction that I mentioned, time will tell if they are successful. A new secular bull? Don't count on it! As the chart below shows, the Dow Jones Industrial Average, along with other the major US averages, have decisively made new all-time highs and broken out of its trading range, can we expect the launch of a new secular bull market for stocks? Zooming in, here is the 10-year monthly chart of the Dow. The upside breakout is clear on that chart as well. Despite the technical evidence, I believe that the odds that this is the start of a secular bull market is low for three reasons. All of the are signals that valuations are elevated, which is what matters in the long-term. Black’s New York-based firm, which oversees assets worth $114 billion, generated $14 billion in proceeds from the sale of holdings between the first quarter of 2012 and the first quarter this year. The industry’s focus on exits has reduced volumes of leveraged buyouts this year, with the number of private-equity deals announced declining 20 percent to 3,047 worldwide from the same period last year, according to data compiled by Bloomberg. “It’s a difficult environment to find really attractive things when the markets are robust as they are,” Fortress’s Edens said yesterday. The $1.1 billion Weitz Value and $980 million Weitz Partners Value funds each have cash stakes that are close to 30 percent. At the $10.6 billion Yacktman Focused fund, cash has crept up from 14 percent a year ago to 19 percent. The $1.3 billion Westwood Income Opportunity has about 16 percent in cash, more than double what it had at the start of the year. Cash makes up about 28 percent of assets in the $8.9 billion IVA Worldwide Fund, up from 10 percent a year ago, and is 33 percent of the $508 million GoodHaven fund, up from 19 percent a year ago. Those are some seriously contrarian positions. The average diversified U.S. stock fund has less than 5 percent in cash, according to Morningstar. For funds such as IVA Worldwide that fall into the "world allocation" fund category and invest globally across a wide range of asset classes, the average cash stake is below 15 percent. There’s no big macroeconomic prediction fueling the move of these value managers into cash. Just some simple investing discipline as managers pare positions in stocks they bought at deeply depressed prices. The Leuthold Group reports that the median price-earnings ratio for large-cap value stocks is 13 percent to 25 percent above its long-term historic norm; large-cap growth stocks trade at an 8 percent to 10 percent discount to their historic norm. While not intended to be a market-prediction tool, it has worked nicely as one, especially for investors with a time horizon of a few years. Academic studies have ratified its value in this regard. The market-newsletter tracker Hulbert Financial Digest has ranked it first among market-timing services in forecasting four-year market performance. Since 1970, the VLMAP, as it is known, has flagged the tremendous buying opportunities at the bear-market lows in 1974, 1982 and 2009, each time suggesting the median return potential was an annualized 25% or more over the next five years. That’s almost exactly how the Standard and Poor’s 500 index has performed in the four-plus years since the March 2009 market low. Conversely, every time the number has fallen to its current 7% level – which is in the lowest 10% of all readings since 1970 – the broad market has been flat or down over the subsequent half-decade. The combination of VLMAP, private-equity and value managers represent long-term patient money and modeling techniques. Private equity and value managers are not day-traders or swing traders, but their ticks are in months or quarters. So when patient money tells me that stocks are expensive, I have to sit up and take notice. To be sure, short and medium term fundamental and technical indicators are still supportive of fresh highs in the major US equity indices. Market breadth remains positive and Street consensus forward earnings continue to grow, according to Ed Yardeni, and this is bullish for equities. Regardless, long-term investors who put money to work in the stock market today are likely to be disappointed if they were to come back and examine their positions in three to five years. The signs are unmistakable. China's economic growth rate is slowing. Notwithstanding the anomalous official July PMI number that many viewed with skepticism, economic releases, one after another, point to a slowing economy. On July 20, the Broad Group broke ground on Sky City on the outskirts of the south-central city of Changsha. The skyscraper will rise 838 meters (2,749 feet) into the heavens to become the world’s tallest building. If that weren’t feat enough, the project aims to wrap up construction in 90 days and at almost half the cost of Dubai’s Burj Khalifa, which it would top. [T]he experiences of Japan, Malaysia, the United Arab Emirates and the U.S. show an uncanny correlation between architectural one-upmanship and economic doom. In the 1920s, for example, New York’s Chrysler and Empire State buildings opened amid the Great Depression. Later, New York’s World Trade Center and Chicago’s Sears Tower presaged fiscal crises and the breakdown of the Bretton Woods system. I would make the analogy to Japan's Lost Decades. Despite over two decades of slow and no growth, social tensions have not risen to the extent that there have been few mass protests and talk of government overthrow. China’s property market will adjust similar to what happened in Japan and Taiwan rather than in Hong Kong or Southeast Asia. The former was gradual, and the latter fast. In 1998, banks in Southeast Asia owed short-term dollar debts to Western banks. When the debts were not rolled over, these countries had to raise real interest rates enormously to contract domestic credit in order to pay off foreign creditors. Surging real interest rates caused their property markets to drop off a cliff. The debts in China’s property bubble are mostly held by local governments and property developers. Total household debt is one-third of GDP, compared to nearly 100 percent when the United States’ bubble burst in 2008 and Japan’s in 1992. On balance, the bursting of the property bubble will boost China’s household demand. The lower property prices will decrease the need for savings. While I respect these points of view, I remain concerned about the risk of financial contagion. 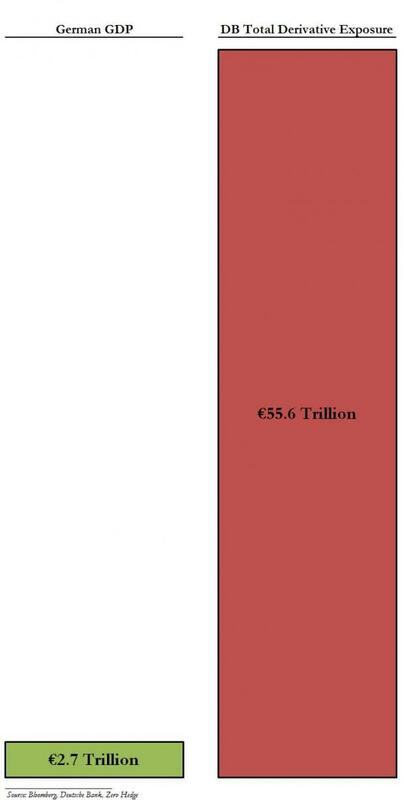 Consider this Zero Hedge post about the size of Deutsche's derivative book relative to its own balance sheet. Can anyone truly say that there isn't a bank (e.g. Deutsche, JP Morgan, HSBC, etc.) doesn't have some outsized derivative exposure to China? We have seen what happened to the credit markets when the talk of Fed tapering hit the tape. Supposing that China's economy unwound itself in a disorderly way, leaving the formal and shadow banking system with sky-high non-performing loans. Wouldn't a risk premium on other EM paper surge? Even if Deutsche, JP Morgan, HSBC, etc. were to be insulated from direct credit risk in China, you can't tell me that these same global banks aren't insulated from rising risk premiums on EM paper like Brazil, Turkey, India or Indonesia? I have followed Stratfor for years and I value their analysis as a barometer of how the Inside the Beltway thinking evolves. Now that even Stratfor is trumpeting the China slowdown thesis and how the leadership can navigate the turmoil, investors can expect that the markets will start to think more about the risks to a China slowdown and price the risk accordingly (recall the page 12 to page 1 analogy). Industrial commodity prices, another key indicator, remains in a downtrend. However, there may be some hopeful signs of stabilization, but I would not want to sound the all-clear until this index rallies through the downtrend line. 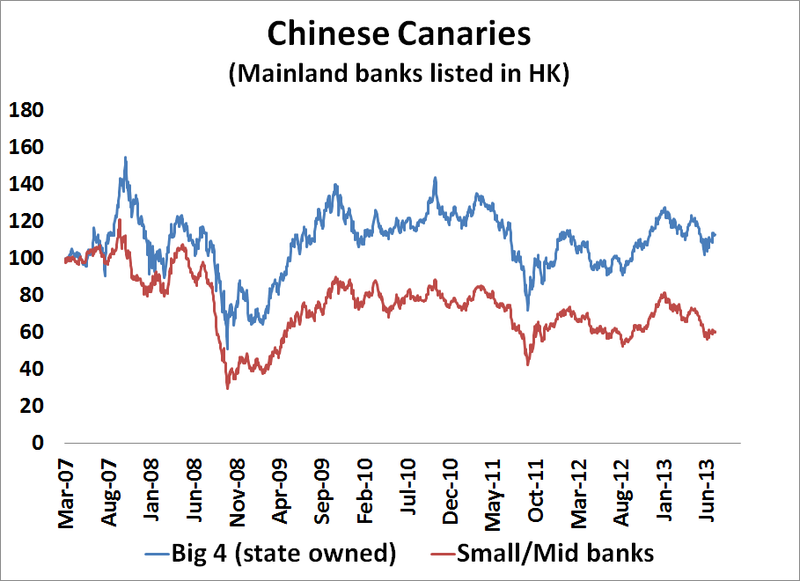 Finally, my Chinese canaries index of Chinese mainland bank stocks listed in Hong Kong as a measure of the degree of perceived stress in China's financial system is indicating elevated stress levels. In particular, the small and mid sized bank stocks (shown in red) are nearing the lows set during the Eurozone crisis of 2011. Will China crash? If it does, will it take the global financial system down in a repeat of a Lehman Crisis? I have no idea. The risks have always been there but the Stratfor article suggests that the market spotlight is turning onto this topic and I would expect risk premiums to rise accordingly. Investors can monitor the risks using some of the metrics that I have detailed in order to get a better handle on the situation. 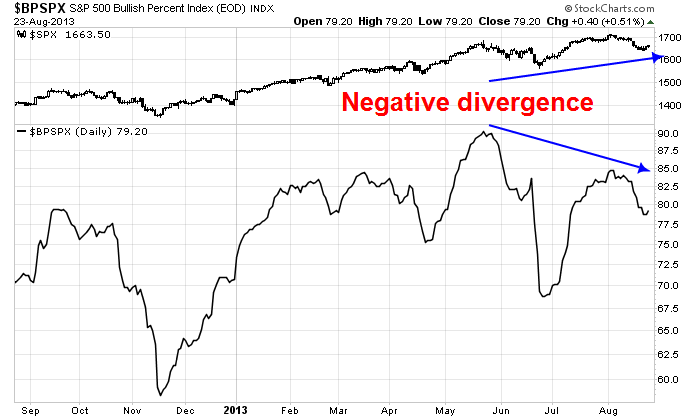 Will stocks get bad breadth? Ho hum, another all-time high in the popular US stock averages. With so much momentum, is it too late to chase this rally? The key short-term technical indicators that I am watching are the relative strength of small and mid-cap stocks relative to their large cap counterparts. Small and mid caps have been on a tear against large cap stocks. Technicians interpret small cap strength as positive breadth - the broader based the advance, the more bullish momentum there is. However, a glance at the relative performance of the small cap Russell 2000 ETF (IWM) against the SPX (SPY) shows that small caps are testing a key relative resistance level. Late in the game for small caps? I do think, however, that the move from 17 to 18 is the final stage, and the scary part is, I think it could be a rocket-launch one. We are in the final move in which the few remaining bears either commit suicide or just quit trading for the rest of their lives, because the past 4.5 years have been so grinding and discouraging. I can also sense the attitude change among both bulls and bears. 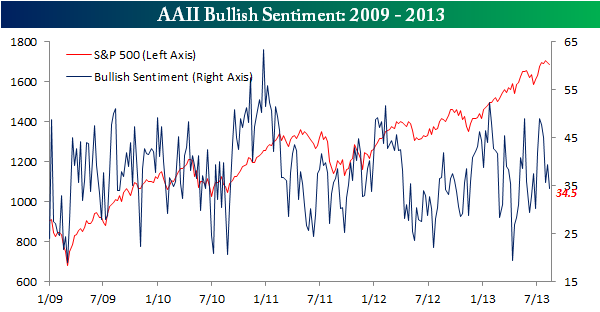 The obnoxiousness and I-told-you-so disposition of the bulls is soaring, and overconfidence is rampant. And the timbre and tone of Slope is changing as well. In my own self, I have sense a deep and persistent disturbance – and despair – which just tells me what this market has done to me. And looking at stuff like Tesla – hell, yeah, it’s a great car, but Jesus Christ, this stock chart is just comic. So the good news for the bears is that I seriously think we’re in the final throes of this disgusting insanity. The bad news is that we’re not just a few points away; I think we’re going to enter the final orgiastic bullish spasm which snuffs out the bears once and for all. And then all holy hell is going to break loose. I only hope we’re all still here to enjoy the fun, because witnessing worldwide financial mayhem, at long last, would put a twinkle in my eye. In a post today, he wrote referred to his previous post and wrote that, since he was current leaning bearish in his positions, that the analog is painfully true so far. He did not reveal what his Russell 2000 target other than to his subscribers. Since I am not a subscribe I have no direct knowledge of his target, but based on an eyeball estimate of his analog charts, it is suggestive of a Russell 2000 target in the 1100-1120 area. What is there in its place is a supernatural ability to spot analogs. I’m not just talking about charts; I’ve always been strong with analogs. That’s probably why, as a kid, my IQ tests were so misleadingly high; they rely a lot of analogies, and I was amazing at them, so people were led to believe I was really smart. Ha! With the Russell 2000 closing at 1059.88 and the presence of relative resistance in both mid and small caps stocks, it suggests that the risk/reward ratio for the higher beta small and mid-cap stock averages are on borrowed time. If small and mid-caps do fail at these key relative resistance levels, then the stock market will be said to be suffering from bad breadth - and another technical underpinning of this rally will have been removed.